Welcome to First Maryland Company, Jamestowne Society. The Jamestowne Society, is a national organization of descendants of the first permanent English settlement in America. The First Maryland Company, located in the state of Maryland, was chartered on November 8, 2014. To promote the restoration of historical records, documents, objects, and edifices which are of lasting cultural value to the people of Virginia and of the Nation. After joining the national society, a member may choose a company membership. Members of the Jamestowne Society are warmly welcomed to consider joining the First Maryland Company. We are planning a variety of programs, at locations in each Maryland region. For a membership form, please click on the button below. The English first settled the colony of Maryland in 1634. King Charles I granted the land south of the 40th parallel to the Potomac River to George Calvert, Lord Baltimore. The 1st Lord Baltimore died before settling the colony. His son Cecilius Calvert, the 2nd Lord Baltimore, organized the expedition of colonists. His brother Leonard Calvert served as the first Governor of Maryland. Two small ships, the Ark and the Dove, set sail on November 22, 1633. The Ark measured about 100 x 30 feet, and Dove about 76 x 17 feet. The ships carried about 140 people and their supplies on a 4-month voyage across the Atlantic. The majority sailed on the Ark, the larger ship. The Dove would remain in Maryland for the colonists to use for transportation and trade. 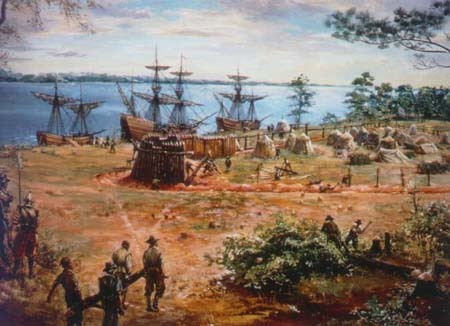 The colonists planned to trade with the Jamestowne colonists for cows, pigs and horses, so they brought other items to trade, such as cloth, sugar, spices, and other items that could only be gotten from England. Lord Baltimore established Maryland as a colony where people of all Christian religions could practice their faith, grow wealthy, vote, and hold public office. Lord Baltimore enacted the law, A Law of Maryland Concerning Religion. Source: Maryland Historical Society. Designed by Lake Ontario Design.